Specific trainings for government affiliates will be posted soon. Please view our calendar for a general list of our upcoming trainings. Whether because of changing lifestyles or simply because houses are becoming outdated, millions of North Americans are renovating their homes every year, spending more money annually on renovation than on new home construction. But renovations can be fraught with unintended consequences like indoor air pollution. 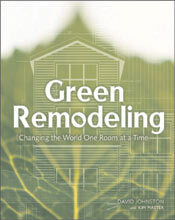 How do you remodel in a healthy, environmentally friendly way?